Do you know what you're wearing for NYE yet? I always love the idea of black tie parties where everyone dresses to the nines!...because black is the new black is the new black. It's just fabulous and it always will be. Not to mention an absolute must if your last name is Sheppard. This is one of my favorite special occasion dresses...and it's black. That pretty much sums it up! I purchased it several years ago to wear to a wedding and at the time, I'd never seen anything like it. Neither had anyone else! Everyone asked if it was two separate pieces, but it's a one-piece wonder. 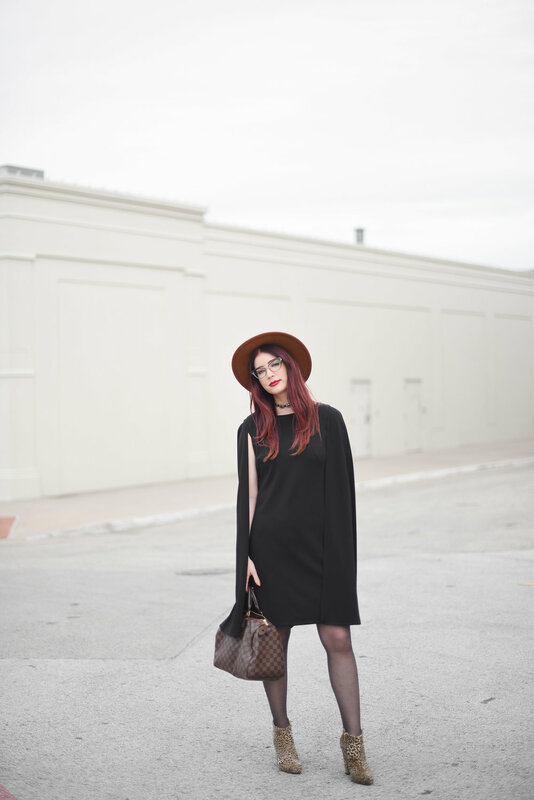 :) The cape trend is in full effect this year, and this Adrianne Papell stuck around for the fun. 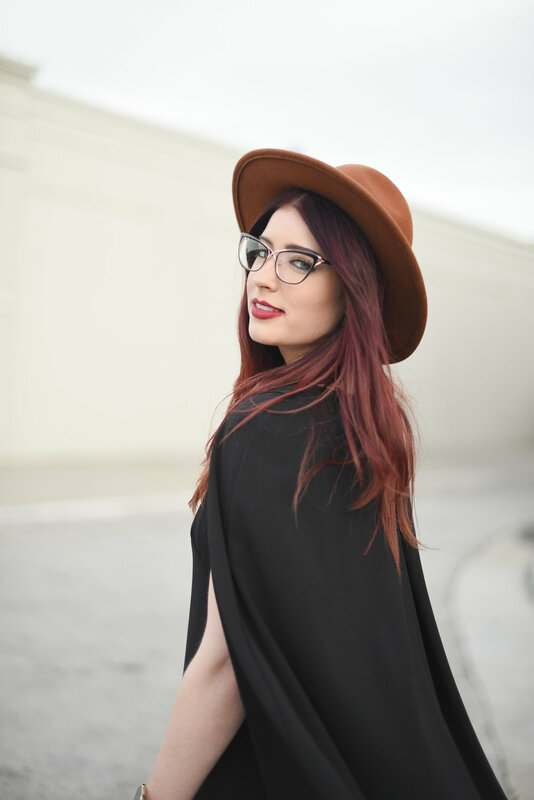 I paired it with patterned booties and a floppy hat to add some drama to the classic look, along with a western-flair choker to pull in a trendy feel (as if the look wasn't trendy enough as it was). 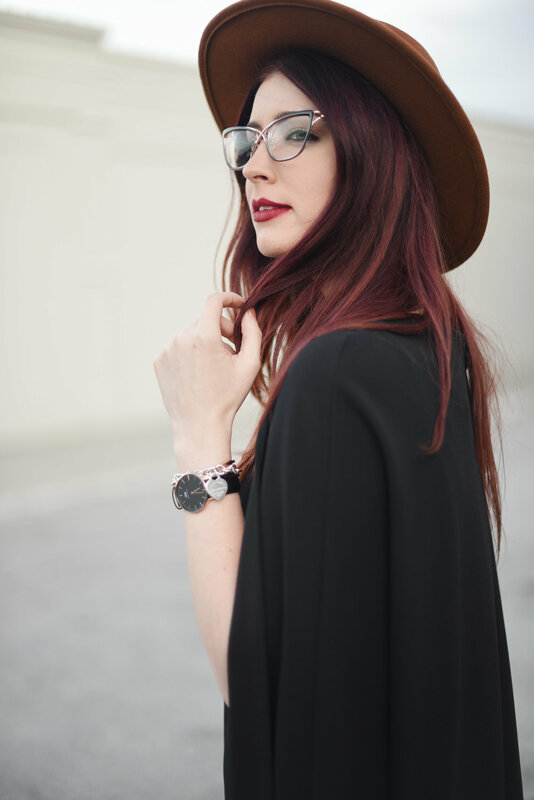 This dark lip is one of my favorites this season and it seems as though I swoon over my DW watch in every post. ...but first! Keep in mind that metallics and glitter make any NYE outfit extra special, so I suggest throwing in a few shiny objects (like this gold pleated skirt or silver) to add some spice! Ditch the heels and keep it comfy with these glitter toecap sneakers or these metallic tassel loafers! These are super festive too...I have too many favorites! And yes, that is a sequin fanny pack included in my faves...don't judge me. U.S.P.S. Deadlines Within the U.S.
Dec. 21: Last day to ship via FedEx 2Day and FedEx 2Day A.M.